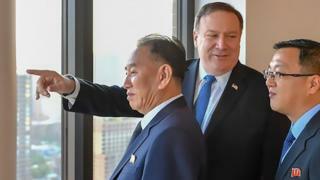 The right-hand man to North Korean leader Kim Jong-un and US Secretary of State Mike Pompeo have concluded two days of talks in New York. Gen Kim Yong-chol flew from China on Wednesday to discuss a historic summit between the two nation's leaders. US President Donald Trump has told reporters he expects Gen Kim to come to Washington DC on Friday and deliver a letter from Kim Jong-un. Speaking aboard Air Force One on his way to Texas, Mr Trump said the envoy will "be coming most likely tomorrow to the White House to present me with a letter from Kim Jong-un". President Trump cancelled the 12 June summit, but both sides have since made fresh efforts to revive the plan. Thursday's talks concluded early due to progress being made, a US state department official said. Mr Pompeo tweeted after the meeting that the talks had been "substantive". "As the president says, if it happens, we'll certainly be ready," she said. Just months ago the idea that this powerful North Korean official could visit New York was unthinkable. Until recently Kim Yong-chol was blacklisted in the US. A senior state department official said he and Mr Pompeo were trying to get to know each other after initial meetings in Pyongyang earlier this year. But he also said they needed to reduce the gap between them over the extent and pace of nuclear disarmament before the summit could go ahead. He also acknowledged that the US had to find a way to convince the North Korean leadership it would be secure without such weapons. 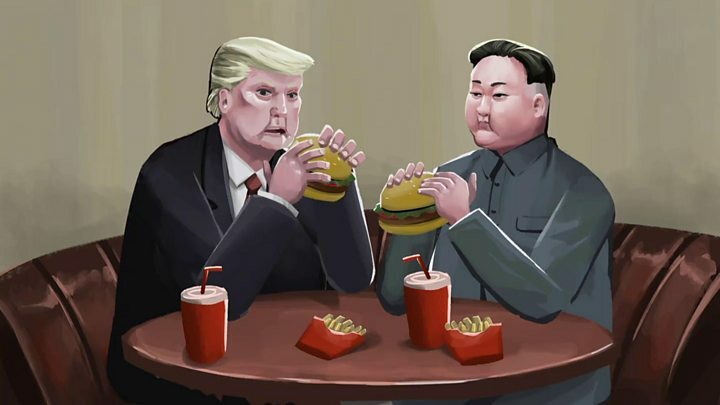 But this high-level meeting shows that President Trump and Kim Jong-un want the summit to take place, and therefore many believe these two men will find a way to make it happen. Who else has been talking? North Korea's Deputy Foreign Minister Choe Son-hui has also met Sung Kim, a former US ambassador to South Korea, at Panmunjom on the border between the two Koreas. Meanwhile, Russian Foreign Minister Sergei Lavrov is in Pyongyang for talks with Mr Kim, the first time the North Korean leader has met a senior Russian official. Mr Lavrov extended an invitation to Mr Kim to visit Moscow.